This month, we may be buying chocolates and flowers or arranging special treats and events to show the special people in our life how much we care. 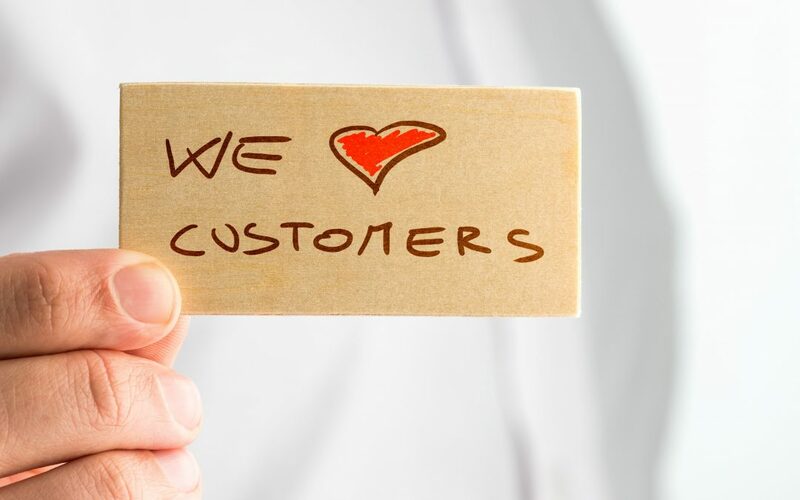 Let’s throw a little bit of that love in our customers’ direction with some great customer loyalty strategies that have NOTHING to do with conventional “loyalty” programs. Only customers create cash flow and there are so many small ways to show them you care, all year long. 1. Have a real person answer the phone instead of leaving them in a maze of automated responses, and you’ll increase brand loyalty by being different because it’s so rare these days. Yes, it’s an investment… but it’s priceless. Just remember your surprise and delight the last time a real person picked up the phone and tried to be helpful. Then, think of how annoying it is when you’re asked to enter your account number for better service, and then asked by the live person you finally reach for your account number. How do you feel when you’re on the receiving end of “your call is important to us… we are currently experiencing higher than normal call volumes…” Do you go as crazy as I do when there’s no option to reach a real person and the automated attendant simply keeps saying “sorry you’re having trouble. Let’s try that again”? Or when a recorded voice continually keeps suggesting that you “visit our website” for self-serve options? This Valentine’s Day, put the service back in customer service! Play customer for a day. Call your company. See what you experience. Then take steps to get people to a real voice faster than now, or better still, immediately. Yes, I used to run a call center many years ago (but we still had a real person answer the incoming call) so I appreciate that there are economic realities and some really darn good reasons to put customers through hell for a while so that an agent can be cued up to take the call. However, if Apple can figure out a way to answer their phones on the first ring (and they often do! ), you can do it too. 2. Get it right the first time to reduce customer churn: When you get told “no” do you meekly go away or do you ask to speak to a supervisor? It’s estimated that senior executives spend up to 34% of their time dealing with escalated customer service issues. And the majority of customer service issues are what I call “self-inflicted wounds” – mistakes on the part of the company that could have been avoided. Think of the costs you could avoid and the time you could back into your busy schedule when you achieve “get it right the first time”. Empower your people to say YES without a customer having to escalate the issue to a manager. Because the other surprising research is that front-line folks usually give away LESS in the way of concessions than a manager does once they receive an escalated call! It sounds more risky… But it’s actually LESS risky and creates a better customer experience. Try it! 3. Save them time to increase customer satisfaction and retention: There’s never enough time in your day. Your customers have the same challenge! Are your products easy to use or convoluted? Are your ordering processes streamlined or cumbersome? What can you do to make their lives easier and save them time? One of the things I love to do is lead an exercise called “Staple Yourself to the Experience”. When you follow the experience that a customer goes through at every stage of doing business with you, you’ll get seriously motivated to make some changes. Along the way, you’ll drive needless cost out of your system. Its win-win! 4. Stop selling and start listening to build long term customer relationships: When customers leave 3 out of 4 times it’s because they feel a sense of indifference on the part of the vendor. The very best way to show customers that they matter is to make the time as a senior executive, to listen to their goals, their roadblocks, their issues, their plans, their challenges, and what they need from you to make it happen (which may or may not be in your current product and service lines). The big benefit here is that you deepen the relationship with your firm – if your rep ever leaves the relationship doesn’t go with them. I call that a Value Creation Conversation and I often train senior executives to take the time to listen to their most critical customers, turn knowledge into improved service, and improved profits. Is this YOUR year to listen? If so… let’s talk. 6. Become the path of least resistance to increase your number of engaged customers: Have you ever noted that parks and campuses have formal paths as well as the informal dirt paths made by people getting where they need to go faster? When you look at what it takes to do business with you vs. your competition, make sure you’re not trying to force-fit your customers onto “your” well-laid out path. Instead, understand the “dirt path” that will get them where they want to go more easily. 7. Deal with the glitches: When on occasion you don’t get it right the first time, get it right the second time. Simply empower your front-line people to create a positive experience for your customers instead of leaving them bruised and battered by the experience. Research shows that your front line people will give away less in concessions than a manager will once the issue is escalated. Does this sound familiar? It’s because you just read this above, and its well worth repeating! 8. Create a feel good to improve customer loyalty: When you think about all of the vendor interactions you have each day in your personal or work life, how many of them are enjoyable? How many of them do you dread? How many are so bland that you don’t even remember them? Customers can’t NOT have an experience. Only you can determine if it’s good, bland, or bad, so choose wisely what you want to create, and then help every single one of your people understand the experience you want them to deliver. They make great decisions about how to handle cranky spouses and children in their personal lives every day – they can make great decisions to put a smile on your cranky customers’ faces too! 9. Solve their real challenges to retain clients longer: “Real challenges” are the ones that are quietly driving your customers nuts but they don’t think there’s any solution for so they never think to ask. However, YOU have uncommon skills, knowledge, expertise, or the ability do something about it when you go beyond business as usual and add ingenuity to the mix. These challenges are slowing them down in their business and could benefit from your outside the box thinking. If you’re not sure what these real challenges are, go back to point #4. 10. Provide peace of mind as the ultimate hard-to-copy way to eliminate customer churn: This is one of the most powerful ways to take care of your customers and keep them coming back for more. Think about the vendors you can count on to always come through for you, whatever it takes. Is that how your customers see you? If so, you’re a partner instead of merely a supplier that keeps them up at night, wondering if you’ll come through for them. None of these 10 strategies are rocket science. But it’s not always easy to implement simple ideas. As always, if you want support to create real change for the better in your business, just book a time in my calendar and let’s talk. In the meantime, what’s the one idea from this list which, if you implemented it, would have the greatest positive change on your business… and on your customers?